Tomato and Red Pepper, Thyme for Cooking easy first course soup. The combination of red tomatoes with red peppers makes a brilliant 'Tomato Soup' with just a hint of something to take it above the ordinary. Garnish with a dollop of yogurt, pepper strips, olives, shredded cheese, or just some freshly ground pepper. Chop shallots, celery and garlic. Clean pepper and roughly chop half. Heat oil in a medium saucepan over medium heat. Add paprika and sauté 30 seconds. Add shallots, celery and garlic and sauté 5 minutes. Add pepper, tomatoes with juices, herbs and 1/4 cup chicken stock. Heat to boiling, cover, reduce heat and simmer 15 minutes or until pepper is tender and done. Purée either in a blender (easiest) or with an immersion blender. Add as much of the remaining 1/2 cup chicken stock as needed to get your desired consistency (it's a personal thing). Put soup back into pan and heat through. To serve: ladle soup into bowls. 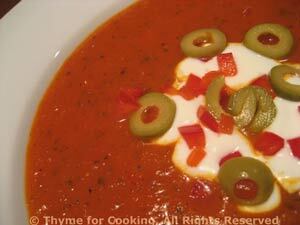 Spoon 1 tbs yogurt into the center of each bowl, or sprinkle with cheese, olives and red pepper.